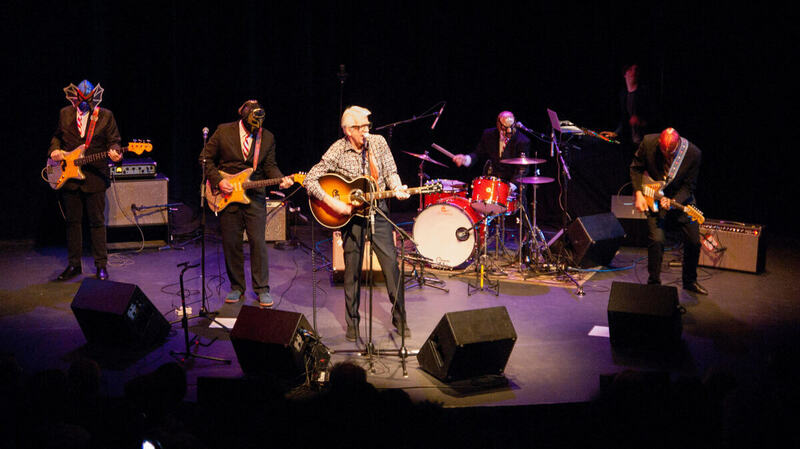 Songs We Love: Nick Lowe & Los Straitjackets, 'Christmas At The Airport' Traveling these holidays? Let a veteran balladeer and his merry masked band be your support group through snowy flight delays. It's happened to most of us at one time or another — having our holidays hijacked by trusting our fates to the whims of Mother Nature and the vagaries of air traffic. It wasn't until celebrated songsmith Nick Lowe's 2013 curio, "Christmas at the Airport," that someone expressed in song what it was like to watch the hopes of holiday cheer fade right before our eyes, on a snow-covered runway in late December. 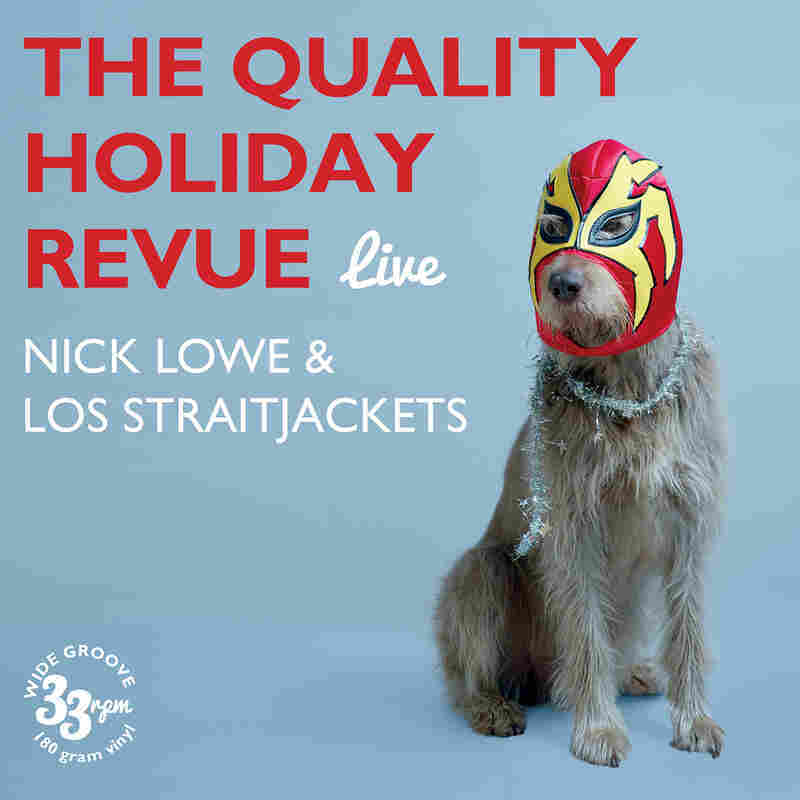 Recorded live in 2014, at Boston's Paradise Rock Club, backed by Nashville's neo-surf band Los Straitjackets, Lowe takes us through all the stages of Christmas-time travel grief, one verse at a time. Stage One: Bemusement. Gazing out the window of his cab upon arrival at the airport, Lowe notices that the place is beginning to look more like the front of a Christmas card than an international travel hub. But even as the tarmac takes on ever-increasing layers of soft, white, wintry down, the full gravity of the situation hasn't yet sunk in enough to truly unnerve him yet. Stage Two: Realization. The cold, hard reality of the protagonist's circumstances suddenly hits home. The fickle finger of fate is pointing at everyone in the airport as if to say, "Nobody's going anywhere this Christmas. Have you seen that snow outside?" Tempers flaring all around him, Lowe sneaks into a secluded spot for a catnap, maybe hoping things will somehow look better when he awakes. Stage Three: Transcendence. We've all had to buck up sooner or later in this kind of situation, find a way to make a homebound holiday fun. For Lowe, that process entails playing with the TSA equipment in the agents' absence, turning the baggage carousel into an amusement-park ride, and even scrounging some fast food from the refuse. Hopefully none of the above will happen to you this year, but if it does, at least now you have a soundtrack to help you see it through. The Quality Holiday Revue is out now on Yep Roc Records.